A large variety of flavoured Boerenkaas is produced by Latana Cheese. Despite being a small cheesemaking operation, Latana Cheese is slowly becoming a contender in the local market. At the World Jersey Cheese Awards in 2014, the cheesery’s Boerenkaas (a form of Gouda cheese) and yoghurt balls were awarded silver medals, while its haloumi, feta and Boerenkaas with green pepper received bronze medals. Latana Cheese has also excelled at the annual SA Dairy Championship, winning a bronze medal for its Boerenkaas in the semi-hard cheese (maximum age three months) category both this year and in 2015. In 2016, it took first place in the Dairy Snack Yoghurt (with condiments) category and won a bronze medal in the Any Type of Semi-hard or Hard Cheese (with or without condiments) category. Dean started manufacturing cheese when his wife, Petra, mentioned that she had always dreamed of making cheese. The Latana Cheese team, from left: Lizzie Events (assistant cheesemaker), Ashley-Ann May (co-owner and cheesemaker), and Dean Lategan (co-owner and distribution and marketing manager). with breast cancer in 2012. “It was a difficult time, but I continued with the building of the cheese factory, and we finally opened in June that year,” Dean says. Meeting of Two minds Dean felt compelled to give back to the community, but was not sure how he should go about it. “I know what it is like to be poor and wanted to do something to help uplift the people of this community,” he explains. Ashley-Ann, who also grew up on the farm, presented that opportunity. “Ashley-Ann worked for my wife at home. I asked her to help me out in the cheese factory and was impressed with her diligence and attention to detail. I placed a heap of books on cheesemaking in her arms and told her that she had to study them if she wanted to [learn how to] make cheese,” he said. According to Dean, she returned a few weeks later and told him she had complied with his request. He then started to teach Ashley-Ann how to make cheese. “She is a quick learner and has an excellent palate,” he remarks. However, her true potential became apparent when Dean left her in charge while he helped his brother with a task on the farm. “Thinking it would only take a few minutes, I left the cheese I had been working on outside. Two hours later, I knew everything would be ruined. To my surprise, Ashley-Ann finished what I had started – and the cheese came out perfect,” he recalls. Dean then realised that Ashley-Ann would be a perfect business partner, and a decision was made to allocate 49% of the shares in the business to her. And it proved to be the right decision. 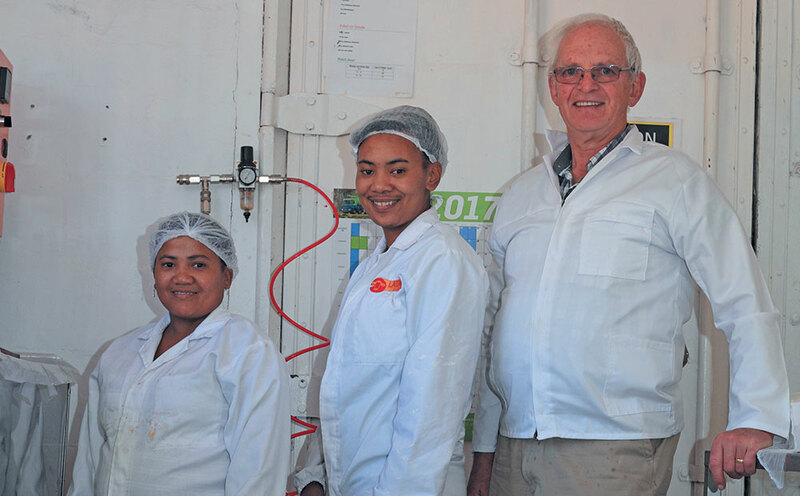 Demand for Latana Cheese’s products continues to grow and various restaurants and guest houses in the Klein Karoo are currently supplied with the cheeses, while consumers can also buy different cheeses and other dairy products directly from the factory on the farm. Although most of the cheesery’s earnings so far have been re-invested in the business to help it grow and expand production, Dean says it is only a matter of time before the business starts showing a profit. After completing a course in cheesemaking, Ashley-Ann proved herself as a cheesemaker, and has completely taken over the cheesemaking part of the business, while Dean remains in charge of distribution and marketing. And Ashley-Ann, at 23 years-old, is delighted with the way things worked out. “I used to pick tobacco, which required working long and hard hours in the sun,” she says. Ashley-Ann’s diligence has also been recognised further afield. At the request of the regional office of the Western Cape Department of Agriculture, Dean entered her in the 2016 Western Cape Female Farmer of the Year competition, where she won the Ministerial Award (Youth). The two have applied for funding from the Comprehensive Agricultural Support Programme (CASP) and plan to triple their factory’s production capacity. “We’ve reached our full production potential and would like to expand production over the next year or two,” Dean says. They also plan to incorporate goats’ milk cheese production into the business and have presented a plan to the Western Cape Department of Agriculture, whereby Latana Cheese will source goats’ milk from subsistence farmers in the area. The plan entails helping these small-scale farmers acquire about 10 milk goats each, with the assistance and production support of the department. “It makes sense for these farmers to keep milk goats, as most of them traditionally keep livestock. Milk goats are, however, ideal because they are quite ‘light’ on the veld,” Dean says. Ten milk goats will need as much feed as one Jersey cow, while a single milk goat will produce 4,5ℓ to 5ℓ of milk per day compared with the 30ℓ per day produced by an average Jersey cow, Dean says. The pair then hopes to acquire a mobile milking parlour with a refrigerated tanker, so that the goats can be milked on site and the milk cooled immediately after milking. This would enable them to closely monitor the health and condition of the goats, and ensure stringent quality control and hygiene practices. Incorporating goats’ milk products into the cheesery’s range also makes business sense, due to the growing demand for ‘healthy’ food options, as well as for new tastes, Dean says. He adds that cows’ milk cheese sells for about R130/ kg to R140/kg, while goats’ milk cheese is sold for about R600/kg. “South Africa imports [a lot of cheese] from all over the world each year. It is my dream to be able to replace some of these imports with unique locally produced products,” he says. Email Dean Lategan at dean@lategan.co.za.